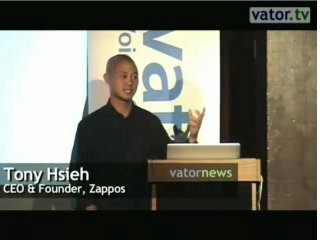 Tony Hsieh, Zappos CEO, received a standing ovation for his presentation last week at Vator Splash, where the top 10 finalists of the Vator Splash competition pitched and seasoned entrepreneurs gave their lessons learned onstage. I don't believe I've ever been to a technology/entrepreneur event where speakers receive a standing ovation. But Vator Splash is not just a tech event with presentations designed to give the audience an update on industry trends. Splash is where keynote presenters inspire and teach the audience on how to be better entrepreneurs. Tony did just that. You should watch the whole presentation (this is the first 30 minutes of the presentation), but here are my key takeaways. 1) Because Zappos believes so much in its unique company culture, it is allowed to run autonomously from Amazon. The pre-requisite for being purchased by Amazon was to be able to "remain independent." 4) Seventy-five percent of orders come from repeat customers. In Q1 2010, revenue grew 50% quarter-over-quarter. 5) What is customer service? 6) If companies get the company culture right, delivering great customer service happens naturally. 7) Zappos has an annual culture book made up of employee feedback about Zappos' company culture. Post a comment here if you want a culture book, and we’llget you a free culture book from Tony. 9) Go to 23:33 where Tony talks about the company’s corevalues.